I definitely haven't done enough shooters for you thirsty people. I have a love-hate relationship with the little blighters. On one hand they're always fun and can be an interesting way of trying out flavours (or textures, incidentally do not ever consume that drink, it's a thing of evil) on the other, you wouldn't exactly describe them as a sophisticated genre. I mean I like a flat liner as much as the next man but it's hardly the first thing you think of as a relaxing post-work libation. The Crack Baby is a wonderful little exception to the rule of sophistication. 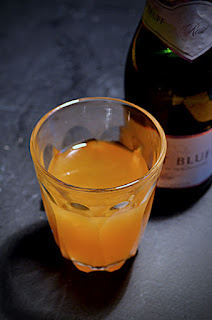 The passion fruit and Chambord allude to those moreish fruit salad sweets, but the champagne and vodka are there to reassure you it's a grown up drink. Equally adept at setting a night up as it is concluding one and with a recipe that consists of equal parts of each of the ingredients it's a doddle to remember too. *You're making more than one right? Dear god, that cement mixer sounds vile. I burped up my lunch reading about it. This sounds good with maybe another juice choice. Passion fruit tastes rather anonymously fruity to me. These look so sweet and innocent. They're nothing but trouble. Shots sound dangerous, but I think with more cava it would still be yummy. Will definitely be trying, (both ways, for scientific purposes).